In the early 1980s, the Harmony Gold Company decided to import the classic Japanese anime Super Dimensional Fortress: Macross series over from Japan and bring it to North American TV as an action adventure series for kids 8-15. However, they discovered that TV syndicators liked series to have a minimum of some 65 episodes. Unfortunately, Macross had only some 36 ½ hour episodes. To compensate for that, the American producer added two separate unrelated anime series and smushed all three together into a three generational epic (to the horror of many an Anime purist) and released it as Robotech in 1984/85. The story begins when a starship crashed on Earth in the 1990s. The ship was salvaged by the UN and the technology, known as Robotech, was shared around the world. On the eve of mankind’s first leap to the stars (the now rebuilt starship was renamed the Super Dimensional Fortress-1 or SDF-1), a fleet of several million warships, uh, manned by an alien race known as the Zentradi (a race of 50 foot tall humanoids) entered the solar system with the goal of capturing the SDF-1 for themselves. Thus began an epic three generations of war against three different alien races who wanted what the humans accidentally discovered. The series caught on in North America, despite being heavily edited, for its adult situations and loads of human on alien fighting. What made this series a landmark for animation was that it combined excellent SF combat sequences with good writing (except the annoying songs) and its nasty habit of killing off important characters (villains or good guys) over the course of the series. Unlike most action series, animated or not, it didn’t treat death and destruction as a mere flesh wound to be forgotten the next episode. Many of the characters suffered whether it be physical or mental wounds such as Post Traumatic Stress Disorder, dealt with the philosophical issues of war and/or regret for actions done or not done. For most kids and teenagers who saw this show, it wasn’t about emotions, philosophy or trauma, concepts that were alien to many of us till much later. Macross (I will not confuse/bore people with by using Macross/Robotech and simply refer to the series as Macross to avoid confusion) was all about the mecha, namely the various fighters the humans used. The most popular are the various versions of the Valkryie--in Robotechese, the Veritech—Fighter. As you can see on the box cover, the Macross VF-1 Valkryie fighters looks a lot like a single seat F-14 which had the add bonus of transforming into a humanoid shaped mechanized robot. It was armed to the teeth like it’s F-14 ancestor, with a huge gatling gun, nose mounted lasers and 12 homing missiles. Many companies (including Revell-Monogram) have produced models of the Valkryie/Veritech fighters in their various combat modes—including some that tried to do all them (not very well I might add.) From what I understand, they collectively suffered the sterotypical flaws of SF models. Poor fit and accuracy. It took a lot of time and effort to make a decent model out of them. In 2000, Hasegawa was the latest model manufacturer to make Macross vehicles and this announcement was greeted with joy by many SF modelers, considering the outstanding quality of their airplane kits. Hasegawa did not disappoint for the most part as these kits were hot sellers in Japan. 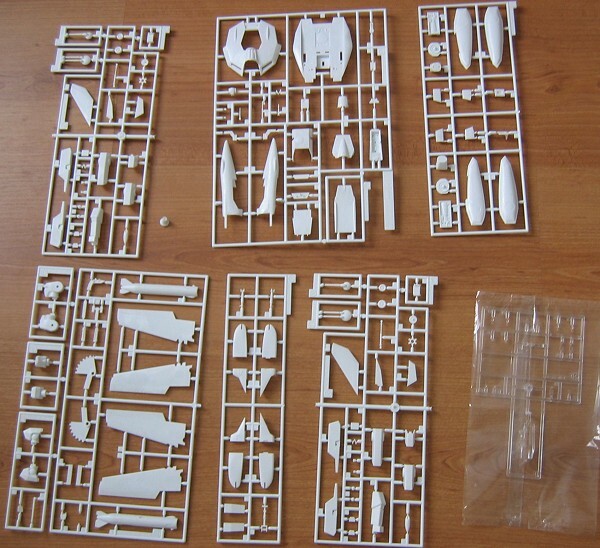 The kit consists of 10 sprues in white plastic—a change from their usual light grey aircraft offerings—and one sprue of clear parts. The detail looks very good to my 1/48 scale eyes—I normally don’t build 1/72 scale models so I am a bit inexperienced when it comes to recognizing good 1/72 detail. There is almost no flash and any ejection pin marks are in places not seen. I don’t think there will be too much sanding and filling as I’ve been told the fit is very good. The clear bits are bagged separately and are very clean. This kit is designed in typical Hasegawa fashion. 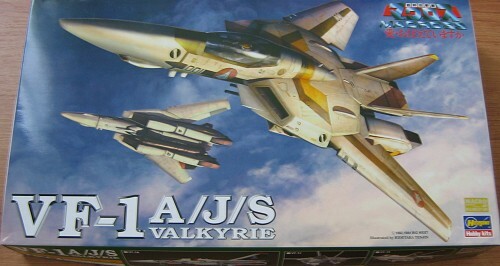 You can make one of three versions of the Valkryie fighter, the A, J and S—the parts are located on separate sprues. From what I can tell from the instructions, the only difference between each model lies in with the mech’s head, located at the bottom of the cockpit. Each version has a different head piece and while everything else remains the same. Hasegawa avoided the whole engineering/design nightmare of the transforming mech by strictly building kits for each of the mech’s three operational modes. In the case of this kit, it is in the “airplane” mode. Now, where are all those missiles? Where is the ubiquitous pilot figure? Well, this is my one disappointment about this kit. <All Together Now> If you want weapons or a pilot you have to buy the separate weapons set! Hasegawa has kept their &*&#$*@!!! tradition alive even in their SF lineup. At the time of this preview (Summer 2005), the weapons set has been reissued. The instructions are typical Hasegawa with well marked diagrams for assembly, painting and placing decals/stencils. The decal sheet allows you to make one of three possible VF-1s. The first one is a VF-1A, an early version with generic markings. The second fighter is Lt Hikaru Ichijo’s (Macross) aka Lt Rick Hunter’s (Robotech) VF-1J. Finally, the third set of markings is for Commander Roy Fokker’s VF-1S, whose squadron markings are very close to those of the high viz era VF-84 Jolly Rogers of the USN. The stencils and markings include US Navy style modex numbers which go well with the F-14 ish looks of the Valkryie/Veritech fighters. The paint listings are all based on Gunze/Mr. Color ones, but they have included the FS595 numbers (mostly typical Western Naval Aircraft colors like Dark Gull Grey, Dark Sea Grey, Insign White, etc) for those who don’t like or use the Gunze/Mr. Color lineup of paints. I have been a fan of this series for a while (saw the Robotech Series when it originally aired in North America as a 14 year old) and when I picked up this kit when I found a couple of these kits lying in the back of a local hobby shop collecting dust. I’m hoping that the kit will build as well as most of Hasegawa models. Outside of Macross/Robotech, I’m not a big fan of Japanese Anime, particularly the bizarre stuff as I’m a simple meat and potatoes kind of guy when it comes to the science fiction I like.